Normally, we tell our customers that they should allow up to 5 days for custom-sized rings, but sometimes they just can't wait that long! We had a California customer call after 5:00pm two days ago, and he needed a "stand-in" ring because he was planning to propose on Friday (today)! Apparently, he was experiencing some unforeseen delay in purchasing a diamond ring (from another jewelry store) because of the rarity of the colored diamond. But, he needed a nice ring so he could propose! 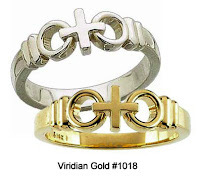 He had selected the white gold Joined by Christ Wedding Band, #1018, and needed it shipped immediately. He preferred a size 5 1/2, but the quickest we could get that one to him (because it required custom sizing) would have just cut it too close, so I suggested he purchase a size 6, which is a stocked size for that item. And, though we prefer to not do this, we also arranged to have the ring and gift box shipped overnight directly from our supplier. He got it on Thursday, in plenty of time for his proposal! So, the moral is, always call or email us (this was done through email) if you have an emergency--we will do everything we can to help you!